Hello there! Wow. I can't believe it's been over a month since my last post! We're almost in a new season. It's mostly just been a combination of laziness and writer's block but it's all over - I'm full of ideas again. 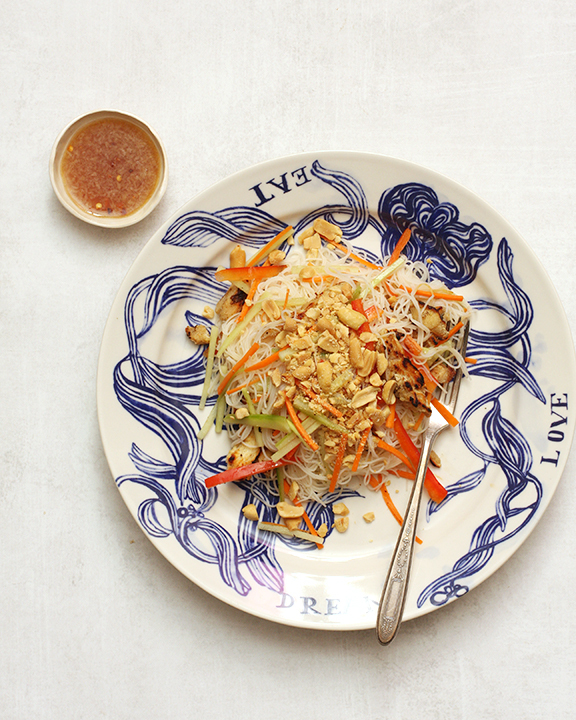 This cold noodle salad is refreshing. I usually like a big bowl of hot, soupy something in the colder months but this just sounded right. I call it lazy because I looked at many a Vietnamese noodle salad recipe online with long lists of ingredients or instructions. (No thank you - I just want a salad.) This is bare minimum effort but still has a sweet, sour, umami sauce and soft chewy noodle, crunchy fresh vegetable contrast of texture. Vegetarians, if you are okay with fish sauce, then sub out the chicken with a brown tofu. If making with chicken, use any type of cooked chicken - grilled leftovers, rotisserie, whatever you may have. Follow the directions on your noodle package. It will probably say to cover dry noodles with boiling water, let sit for 3 minutes, drain and rinse. *Note: my lettuce was not photo ready so it's not featured in the above image. In a small bowl, whisk together fish sauce, lime juice, sugar, garlic and chile flakes until sugar is dissolved. Set aside. Build individual bowls by tossing noodles, lettuce, carrots, pepper, cucumber, chicken and cooked peanuts with a bit of sauce.